Right-click and use "Save Target As" to save to your computer. President Thomas Jefferson wrote the first dog licensing law for his home state of Virginia, because his sheep were being killed by dogs. He wanted to identify the dog’s owners and make them pay for the sheep they killed. By the 1850’s most localities had dog licensing laws that required dogs to wear a collar with the owner’s name and license number. Eventually small wooden or metal discs were used and referred to as "dog tags" and that name carried over to their human counterparts. During the American Civil War (1861-65), only 58% of soldiers killed in action were positively identified. Soldiers worried that if they were killed their families would never know what happened to them, other than that they were missing in action. They wrote their names on a piece of paper or a handkerchief and pinned it to their clothing before going into battle. Some soldiers went to the trouble of carving small wooden discs with their names on them. They drilled a hole in the disc and hung the disc from their neck with a piece of string. Eventually merchants began producing and selling metal disks to soldiers. Harper’s Weekly Magazine advertised "soldier’s pins" made of silver or gold and etched with the soldier’s name and unit. Some soldiers made their own ID tags by grinding off one side of a coin and then etching their names on it. Dogs wore similar identification tags, so it wasn’t long before soldiers began referring their ID tags as dog tags. By the 1890’s the US Army and Navy began experimenting with issuing metal identification tags to recruits. During WWI, the French wore a bracelet with a metal disk, called a plaque d'identité, that was engraved with the soldier’s name, rank and formation. When the United States entered the war in 1917, all soldiers were issued two aluminum tags that were hand-stamped with their name, rank, serial number, unit and religion. The tags were suspended from their necks by cord or tape. In the 1930’s, it was suggested that Social Security numbers be stamped on a metal plate and worn as a dog tag by civilians. That idea was quickly shot down, but it was used by William Randolph Hurst to smear FDR during the presidential election of 1936 when he falsely claimed that the Roosevelt administration was planning to require everyone to wear dog tags. During WWII, tags were stamped by a machine and were rectangular shaped with round ends and a notch at one end. It was rumored that the notch was put in the tag so that the tag could be placed in a dead soldier’s mouth and would hold it open so that the gasses would escape and the body wouldn’t become bloated. Fortunately, the truth was a little less gruesome. The stamping machine required a notch to hold the blank in place as it was being stamped. The tags were first made of brass and later a corrosion-resistant alloy of nickel and copper. 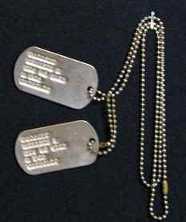 By the end of the war, all tags were made from stainless steel. They were suspended from the neck by a rope, a beaded chain or a stainless steel wire with a plastic cover. The first German military identification tag, the Erkennungsmarke was issued in 1939. During the Vietnam War, new stamping machines were used and the notch was eliminated. Soldiers began taping their tags together so that they wouldn’t make any noise and give away their position. By the end of the war, rubber covers were developed to keep the tags silent. Soldiers often put one tag in their boot, in case their body was dismembered to the extent that normal means of identification were impossible. American-style dog tags are in use around the world, thanks to the post-WWII export of blanks and stamping machines by the US. During the two Persian Gulf wars, Iraqi soldiers wore dog tags that were identical to their American counterparts except that the printing was in Arabic. Soldiers still wear metal dog tags today, but a new generation is being developed that holds a microchip containing the soldier’s medical and dental records. Called a Personal Information Carrier (PIC) it is expected to be deployed soon. The Marines have developed their own version, called the Tactical Medical Coordination System (TacMedCS) that can pinpoint the location of a wounded soldier using the Global Positioning System (GPS). These days dog owners are having microchips implanted in their dog’s necks that store an identification number that can be read with an external scanner. No doubt someday humans will have microchips implanted at birth that will allow them to be located and have the capacity to store massive amounts of information, including every detail of their miserable existence. 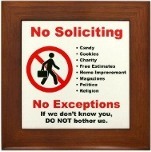 First it will be voluntary, and promoted as a great benefit to mankind. Later, it will be required and used by governments as a means to control people. We’ll all be dead by then, but if our descendents aren’t careful, they’ll end up like dogs on an electronic leash.